Math is a language, and reading math requires students to see the relationship between words, numbers, and symbols. Math Circles is an approach that provides students with ongoing experience and practice comprehending the math embedded in the language of word problems. In small groups, students work with the teacher in a literature-circle model to connect words to abstract math concepts. This model facilitates a deeper understanding of math ideas and helps to develop independence in problem solving. 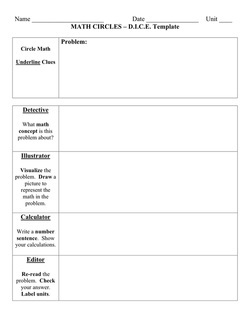 By using a problem solving template, students can begin to internalize a universal problem solving strategy. This provides them with the tools to solve a variety of math problems. Math Circles encourages teachers to focus students' attention on mathematics as a language and not just something that we do. This leads to a deeper understanding of mathematical concepts. "Teachers play an important role in developing students' problem-solving dispositions. They must choose problems that engage students. They need to create an environment that encourages students to explore, take risks, share failures and successes, and question one another. In such supportive environments, students develop the confidence they need to explore problems and the ability to make adjustments in their problem-solving strategies."